The Heist team often travels to different countries around the globe, and one of the incredible perks is that we get to have a taste of local snacks, foods, and beverages − indeed travel and taste buds are deeply intertwined. I recently came back from a trip to Morocco (my country of origin) and wanted to share a small but significant portion of my childhood with the team here in Singapore in a fun and lighthearted way. The aim of this post is to introduce a handful of classic snacks - virtually anyone who grew up in Morocco will recognize these in a heartbeat − immediately triggering a nostalgic feeling. This list, however, is far from exhaustive − there are countless other iconic Moroccan snacks, simply too many to enumerate in this context. I decided to limit the list to three diverse snacks handpicked to offer a variety for this beginner’s guide: one cake, one beverage, and one gum − all of which can be found in any local Moroccan grocery store. We start off our tasting journey with Merendina, a cake whose crisp outer chocolate ganache coats and complements the light, fluffy interior − in turn garnished with a thin, understated chocolate layer that melts in your mouth. When handling a Merendina, proceed with care: the texture is soft and squashy, a harsh grip will sink your fingers through the outer shell and into the spongy cake, leaving an annoying mark on the treat and inevitably causing chocolate crumbs to form. Traditionally, the way to drink Raïbi Jamila (Raïbi for short) a pomegranate yogurt beverage − is not to pour the liquid in a cup, in fact that would be a rather odd thing to do. The trick is actually to peel off the lid about a quarter to halfway through and start drinking directly from the plastic container. The light pink texture is creamy and opaque, the consistency is thick and often stays on your upper lip upon taking a sip and has to be licked off. To me, Raïbi is to Merendina what peanut butter is to Jelly, what Bonnie is to Clyde, Romeo to Juliette… you catch my drift! Together, they form the ultimate childhood snack combination. Flash Wondermint − abbreviated to Flash − is a brand of peppermint chewing gum in which each piece is of a textured, off-white colour. The packaging alone is iconic with it’s retro design − the thin pieces stack up like a deck of cards, ready to be taken out at recess to share with your closest classmates. Eventually, the chewiness dissipates and the gum becomes harder and harder, gradually losing its flavour but always leaving you with a fresh minty breath. For a few Moroccan Dirhams, children throughout the Kingdom have grown up with these snacks - no matter the background. These treats remain ‘sweet’ nostalgia as they accompanied us through our teenage years and into adulthood. I miss them and wish I had brought some from home for the team to try too! New Country, New Culture. What was your greatest surprise? This was my first time in the Kingdom of Saudi Arabia. I am familiar with and comfortable in Dubai and Bahrain, but I knew that things would be very different in the Kingdom. For starters, we went on an Abaya hunting trip on our last day in Bahrain, complete with loose hijabs - prepping ourselves mentally to cover up for three full weeks. I was slightly concerned about our typically gender-neutral research methodologies. We pride ourselves on trying to live like locals, immersing ourselves in their culture and being mindful of our personal and cultural biases to empathize with the people we are designing for. We use an eclectic mix of street side immersions, shadowing and spending hours in the homes of strangers, talking to them and learning from the small nuances of cultures and design. And given that we were spending time with some of the most successful and elusive members of Saudi society, from leading CEOs to members of the Royal family, I wanted to ensure that we follow social protocols while remaining true to our key objective - getting a deeper understanding of specific cultural shifts and unmet needs to design a new financial service. One that will hopefully make a greater impact upon Saudi society in the decades to come. My greatest surprise was how quickly we adapted to a new culture, and how open people were with us in the interviews - it was incredible to see how willing people are to share deeply personal stories with strangers, trusting us with their secrets, frustrations and wishes. Even our key client, a Saudi national himself, was amazed by the rich stories we brought back. I always feel we have an advantage as foreigners, the luxury of being able to question things that are obvious to a local and learning from underlying motivations - but this particular trip was exceptional. In fact, we will be heading back to the Kingdom next month and I can’t wait to see what we will learn this time around. Of course, the experience of deep cultural immersion always comes with personal rewards and challenges. And in my next blog post, I will share some thoughts around maintaining a happy team culture and paying attention to our mental health when we spend a long time away from home, immersed in foreign cultures. 1/ What is the one thing that surprised you about the Kingdom of Saudi Arabia? One of the things that really surprised me was the hospitality and openness of all the respondents we have spoken to. We had a short workshop with a few members of the team from the client’s office before we headed to the Kingdom. Besides educating us about the culture and etiquette in Saudi Arabia, they also cautioned us about not coming across as too forward during the interviews and how it was important to always be extra conversational and friendly. Afraid that I might come across as rude or some of my actions might be misunderstood, I was nervous when I first arrived in Saudi Arabia. However, thanks to the hospitality of the people we’ve met, I got over my nerves very quickly. Many of them were so kind as to invite us to their homes, some even served us delicious food. It seems like everyone in Saudi Arabia is a wonderful host. We are often served fresh juices, Arabic coffee, chocolates, dates and amazing desserts. Always in a particular order. Most of the people we met, including members of the Royal family were friendly and forthcoming. These interviews were surprisingly enjoyable and there was always laughter in the room, which puts me at ease and allows me to excel at being the chatty researcher I am. 2/ What is the one challenge you had to overcome? I do not consider this a huge challenge, but one of the things I had to get used to is not being able to take walks while in Saudi Arabia. They do not have a strong pedestrian culture - their roads often do not have sidewalks and many prefer to be driven to their destination instead. Even though I did enjoy hopping in and out of a car because it was so convenient, after a few days I was really itching for a good walk. This made me realise that being able to walk to different amenities is something that I’ve often taken for granted living in Singapore. Very often, these short walks give me plenty of time to reflect on the day or have a nice chat with family or friends. It was tough not being able to do that in Saudi Arabia but it definitely made me appreciate these small blessings I’ve taken for granted now that I’m back! 3/ What was your greatest learning over these 3 weeks in a completely different environment and culture? It was very encouraging to hear from many of the women we met that they would like to be more independent have greater agency when it comes to managing their finances. Many of them also had lots of business ideas that they are hoping to start. The culture in Saudi Arabia is changing rapidly and it is truly heartening to see so many women being brave and wanting to start something of their own. Sometimes in Singapore, I feel that perhaps we have become a bit too comfortable, and perhaps we forget to push ourselves out of our comfort zones and try new things. This was the longest and most challenging fieldwork I have been part of it - but it was definitely an incredibly inspiring experience as well. Being in a desert - the landscape is so incredibly different from the lush island greenery of Singapore. The streets of the Kingdom of Saudi Arabia stood out in their own beautiful way. Endless hues of pink, beige and brown coloured the houses and the palm trees complimented the picturesque view as we drove along. I constantly found myself glued to the window as we passed by rows and rows of buildings and houses with the same sandy colour palette. Maintaining my fitness is extremely important to me, especially during field work where we are required to keep our energy levels high. Once we came back to Riyadh from Khobar, I was excited to finally have some time to hit the gym, but the reception staff told me that females were only allowed to use the facility at specific times of the day i.e. 9 AM - 11 AM and 9 PM - 11 PM. I came back later at 10 PM and started my routine. And to my surprise, the staff started pulling down the blinds of the entrance and windows so outsiders could not see me workout. At first, I thought it was so cool to have an enclosed space all to myself but then it occurred to me later how unfair this whole situation was. It was definitely challenging to have to conform to the rules and not be able to work out at any time I like. But with that being said, I still respect the culture of the Kingdom and I applaud all the women who have been brave enough to challenge the norms to gain access to their rights. And I realize there are much bigger challenges for women everywhere to overcome. To never be afraid to have a voice for something you believe in. Throughout our research in the Kingdom, I was lucky enough to have met several inspiring women who have made a difference one way or another. We spoke to a lady who was running an organisation for underprivileged women. She shared with us incredible stories about the work they do and the programmes they have created to teach these women about parenting and financial management. I am blessed to have a good life, all of which is owed to my parents - which is why it was even more inspiring for me to learn how women across classes are working together in the Kingdom of Saudi Arabia to build a better future for themselves and their children. SDW Highlights Part III : "Landscape of Loneliness"
We are lucky to be living and working in a vibrant environment like Singapore, where the design scene is booming rapidly. Although part of Heist is busy doing fieldwork in the Middle East, the rest of the team remaining at home base took advantage of the events and workshops happening during Singapore Design Week - this is Part III and the last of the mini-series (Part I can be found here and Part II can be found here). On a bright Sunday morning, Heist attended a workshop co-created by Quantum and Analogy that honed in on the topic of loneliness in the urban environment. This topic, though complex and extensive, is not often discussed and even dismissed as taboo. Although none of us are experts in this subject, and a few hours does not even begin to scratch the surface of this multifaceted phenomenon, we were all curious to learn a little bit more about it. The workshop started off on a casual tone, everyone introduced themselves and we had an ice-breaker to get to know each other better (see image below). Then, we proceeded to take a look at a handful of facts on loneliness. Some were surprising — for example, one may assume that loneliness comes with old age, however as it turns out that is not necessarily the case, several younger people are also severely affected by this phenomenon. Snippet of the gamified icebreaker. What is the opposite of loneliness? Together, we had a conversation about what that may be. Is it connection? Companionship? Could the opposite of loneliness actually be health? Indeed, loneliness is now being spoken about in the context of a public health problem. Social media and technology — having taken over so much of our lives — poses an unprecedented threat, so as a society how do we respond to that? Social media is a relatively new phenomenon, but loneliness has existed historically since the beginning of humankind. If it is true that we have never been as connected as we are today, why does the issue of loneliness seem to be amplified? These were just a handful of “food for thought” questions that arose during our group discussion before moving to an exercise where we were introduced to a fictional persona from a booklet provided. Enter Tina, a 24 year old girl living in Shanghai, who holds a bachelor’s degree and works for a Fintech startup. She lives a relatively comfortable lifestyle —travels overseas 1-2 times a year and has recently purchased a luxury handbag. Her values and priorities are linked: she wants growth, progress, and demands uniqueness — always needing more “success”. At first glance, Tina seems like a well-rounded individual: she enrols in guitar classes and exercises at the gym regularly. However, she experiences anxiety and cites one of her feelings as “being nameless and faceless in a big city”. Do you know a Tina? Perhaps, like me, you relate to some aspects of her personality? How might we design for Tina without “othering” her? The next portion of the workshop focused on looking at Tina’s environment in three different contexts: her bedroom, her workspace, and her transit. We were split into three teams - one per context. My team had Tina’s bedroom, and we started off by looking at the visuals provided for her bedroom. One of the things we noticed was that the windows were small and the bedroom was dimly lit. In every frame, her head was down in a book, on a computer or her phone screen. Her posture seemed relaxed, which made us think about her social face versus her personal face — especially when compared to her posture at the work and transit context where she is sitting or standing upright. This made us think — does Tina actually need a design intervention in her bedroom? That is the space where she can come back to, and shut out the outdoor noise. What is the difference between being lonely and being alone? There was so much to unpack, and my group started to come up with ideas on how to improve Tina’s neighbourhood rather than her bedroom. Some ideas that came up: a community garden and monthly BBQ’s, a building lounge area with pool table and similar games, a mural to be painted by residents… all impactful ways that can bring people together in order to alleviate loneliness. SDW Highlights Part II : "Urban Design Festival VIP Preview!" We are lucky to be living and working in a vibrant environment like Singapore, where the design scene is booming rapidly. Although part of Heist is busy with fieldwork in the Middle East, the rest of the team in Singapore took advantage of the events and workshops happening during Singapore Design Week - this is Part II of the mini-series (Part I can be found here). Heist was invited to attend the event preview at the Jalan Besar Sports Centre. Even though the preview was said to be at the Sports Centre, the event was not held at one of the sports halls. It was actually situated in levels 4 and 5 of the multistorey carpark! Guests head upstairs to the rooftop. Opened in 1932, the Jalan Besar Sports Centre is an iconic landmark of Singapore’s urban fabric. The event, conceptualized by LOPELAB, was an intervention to activate underutilized spaces such as a mundane car park and turn it into an attractive mixed-use environment for members of the community to enjoy. Not only was this a seemingly-impossible endeavour, it was also highly original and successful. One of the key features was the electric blue industrial plastic containers (see images below) which can be turned into seating areas, coffee tables, and even plant holders. The customizable layout unified the space and gave the containers a second life. Several booths were scattered around the space, many of them promoting sustainable products from wood alternatives to diminishing food waste by turning bruised fruits into juices. Various singers and bands were jamming to different tunes on the stage, creating a light-hearted and fun atmosphere. As the sun began to set, we headed to the rooftop and discovered what is arguably the most memorable and mind-blowing element of the event: the roller disco! Grooving to the beats of the DJ, people ate, danced, socialized — and of course — roller skated! Who knew hanging out in a car park could be so incredible? All in all, by promoting local brands and showcasing local performers, this event, with its incredibly unique placemaking, successfully captured the essence of Singapore’s vibrant energy. SDW Highlights Part I : "The Great Outdoors of Design - Redesigning Care with Horses and Caregivers"
We are lucky to be living and working in a vibrant environment like Singapore, where the design scene is booming rapidly. Although part of Heist is busy with fieldwork in the Middle East, the rest of the team in Singapore took advantage of the events and workshops happening during Singapore Design Week - this is Part I of the mini-series. The Care Lab and Equal Ark have joined forces in this experiential workshop called “The Great Outdoors of Design - Redesigning Care with Horses and Caregivers” in which participants link human-centered design with equine-assisted learning (and yes - we were actually able to interact with the horses!). Horses are more than majestic creatures, they are extremely bright and, when adequately trained, are able to successfully engage with people in an impactful and therapeutic way. First, we were split into groups and asked to pick a horse of our choice. My team picked Tata, a mysterious white horse with a noble stance and silky mane. After taking Tata out if his stable, the caregiver gave us insights on his personality. For example, she told us that Tata is popular amongst he elderly — he even leans down on their laps if they are in a wheelchair. That is because Tata responds well to calm and peaceful energy, as he suffers from painful joints and relates to older aunties and uncles in that sense - effectively demonstrating a remarkable sense of empathy. Meet Tata, my team’s stunning “equus caballus” (the scientific term for “horse”). We were then taught about the various tools used for grooming horses and took turns using them on Tata. One thing we’ve learnt is that horses give immediate feedback — if they dislike something or are feeling hostile, it will immediately show in their body language. For example, Tata jerked away or moved to the side if a tool used causes him to feel ticklish. When it was my turn to brush Tata’s mane, I approached him carefully and made sure to remain in his line of sight as to not startle him. I brushed softly and carefully, and Tata responded well. I have many memories of people brushing my hair when I was younger and how much discomfort it caused so I was mindful of that with Tata - indeed it was my turn to practice empathy. A variety of tools used to groom horses. Tata receiving an impromptu grooming session. After a rich conversation with our individual groups, everyone gathered to reflect. We discussed how it felt to engage with our horses, and what we’ve learned about ourselves through this experience. Although everyone had a unique encounter, some common themes arose. We spoke about topics like the nervousness experienced with approaching a new situation or entering a new space, how our own energy levels can affect the external environment, and how body language can serve as a visual cue. After putting all of our thoughts on paper and sharing them, the various points that came up collectively will inspire the process of designing a better environment for caregivers and people with special needs. Last year, Heist lead design researcher Naima won a scholarship to do her Masters at the EIT Digital Academy in Finland. Immersing herself in the culture, Naima has written to tell us of her life in Finland, from education to depressing winters. This is Part III, the final of the series Postcards from Finland. Read Part I here, and Part II here. Ever heard of a place where serious business meetings are held naked? Yes, I’m not kidding. In Finland, Sauna is considered a great way to nurture not only personal but also business relationships. And Sauna in Finland is as simple as that - traditionally naked. Finns grow up with this as part of their national culture - there are roughly 2 million saunas in Finland, a country with a population of 5.3 million. Saunas are located in public spaces and private houses, in summer cottages and student accommodations. Portable Saunas can’t be missed at student parties and business events, which appear in every shape and size. My university’s skiing association has built a movable sauna inside a gondola, and the car workshop association even did one inside a car! Sauna - a Finnish invention and a Finnish word - is not an occasional retreat but a lifestyle. Studying in Finland, Sauna has become part of my lifestyle too. I love the free sauna in the gym after my workout following by a refreshing plunge in the ice-cold sea where a hole and a ladder is kept in the frozen sea solely for this purpose. We’ve all heard that winter here is dark, cold but beautiful, and it’s all true. Surrounding yourself with good company, Vitamin D pills, and lots of activity is essential to stay sane through the depressing winter. Though it’s ~15 degrees in Southern Finland, you can still head out for some fun! Some examples include going to the Sauna, ice-skating, hiking through the beautiful national parks, freeing cars from snow and exploring new transportation methods for kids. Uh-oh! The daily commute can take a bit longer with abundant snowfall. Sledges as a transportation method in the city. Cross-country skiing on the frozen sea is a Finnish favourite. I recently met two Finnish friends on the campus exchanging a “rope”. It turned out to be a life-saving tool in case the ice cracks and someone falls into the sea! The rope has two sharp tips which can be stuck in the ice and guarantees more grip than bare hands should someone fall through the ice crack. “But with this much snow on top of the ice it won’t really help anyway”, my friend said, gently smiling and shrugging. I spontaneously cancelled my plans to walk over the frozen sea to the island nearby. A winter wonderland in Finland. To mark Heist’s third consecutive participation in the Singapore Design Week, our studio opened its doors to participants eager to learn about design research and its methodologies. License to Spy is an interactive session led by our team of designers and design researchers. During the session, the Heist team played clips from a recent project in Vietnam, and revealed some of our “spying” methods - from making powerful observations to conducting insightful intercept interviews. Heist hosts SDW workshop participants in the studio at 1 Neil Road. But the learning doesn’t stop there — after being exposed to design research in theory, it was time to turn these skills into practice. The participants were split into five teams and sent on a “mission” to various sites within the neighbourhood: Maxwell Hawker Centre, Buddha Tooth Relic Temple, and Chinatown street. The objective was to explore the assigned location and apply the newly-learned skills to uncover key learning and highlight potential pain points that can be solved with design thinking. Additionally, each team was handed $10 to bring back an artifact and share a story associated with it. Participants speak about their team's chosen artifact. Participants go on their "mission" in various locations around the neighbourhood. The outcome was overwhelmingly positive, each team brought their respective learnings back into the discussion in different and creative ways. One team, for example, demonstrated a strong sense of empathy by pointing out that they observed little distinction between public and private space within the temple, and discussed the importance of carving out a safe space for prayer shielded from tourists. Another team brought back Singaporean crackers of various shapes and sizes, and created a site model of the hawker centre from scratch, discussing ways to improve the circulation within the space while referencing their intercept interviews with the aunties and uncles that work there. A participant uses Singaporean crackers to create a DIY site model of the Hawker Centre. Once the workshop was over, many participants shared positive feedback with us - saying that they learned a lot, had fun going on their mini-adventure, and felt welcome in a friendly environment. All photographs courtesy of Singapore Design Council. As designers and researchers, partaking in artistic and cultural activities is a crucial part of our job, not only to stay updated with the local and international design scene, but to remain inspired and get our creative juices flowing. Recently, the Heist team was fortunate enough to pay the Singapore National Gallery a visit to experience the exhibition Minimalism: Space. Light. Object — here are some of our thoughts from our creatively-charged field trip. Life - like any good story - is dynamic and unpredictable, so is reasonable to assume that an artist’s work throughout his or her lifetime will be equally as dynamic and unpredictable. It is fascinating to look at the overview of an artist’s portfolio and how their style changes over time. This is particularly reflected in Frank Stella’s work, as his early pieces are strikingly different from his later ones. My first encounter with Stella’s work was at the Whitney Museum of American Art in New York City about 3 years ago as part of the exhibition Frank Stella: A Retrospective. At the time, what struck me was the whirlwind of colours and mixed media materials juxtaposed to create depth in masterpieces such as La Penna di hu -- Italian for “the peacock's feather” (see below). Photograph from my first encounter with Frank Stella’s work at the Whitney in 2016. Fast forward to last week at the Singapore National Gallery’s exhibition Minimalism: Space. Light. Object, where I was introduced to a new facet of Stella’s portfolio. This time around, the string of paintings from the Black Painting series, pictured below (late 1950s, synthetic polymer paint on canvas) were stripped of movement and color. Although formally classified as minimalist artwork - which was after all the theme of the exhibition - it seemed almost conservative when compared to his later work, which is much more dynamic and sculptural - almost architectural. Looking at both works consecutively, what may seem like an aesthetic jump is in fact everything but - rather a gradual progression over several decades of re-working and refining, a laborious task that can be be applied to art and to the self alike. I love thinking about mortality - the transient quality of life, which is why I was awed by the 3 walls of numerical counters made of dazzling blue LED light repeatedly counting down from nine to one. The number zero is replaced by a brief moment of darkness which, according to the artist, represents the pause between life and death, before the cycle begins again. The work reminds me of Buddhist principles of impermanence and rebirth - a constant reminder of the powerlessness of man and that nothing survives death. Looking at the blinking blue lights, I felt a sense of calmness, knowing and fully accepting that life is a constant countdown, a brief pause, then rebirth - an endless cycle. Art is all about evoking emotions and intriguing curiosity - it draws you back for a second look, and makes you think twice on what you saw on the surface. When I saw Untitled (1968, acrylic lacquer on formed acrylic plastics) for the first time, I was glued to the spot for 5 whole minutes, getting lost in the optical experience of Robert Irwin’s art. The installation comprises of a white painted disc, which when illuminated casts overlapping shadows, giving the illusion that it is receding into space. The light dissolved the edges of the disc so that it no longer appears to be contained within a frame but rather, it becomes one with its environment. It got me thinking about how we are constantly placed in different, sometimes difficult, situations everyday and how each of us find various ways to embrace, change or challenge these situations. Whatever our choices are, it will always have an impact - it is up to us to decide if we want to make a positive or negative one. As the sun begins to set, we slowly make our way out of the National Gallery, fatigued by the heaviness of our minds now buzzing with fresh information and ideas. It is a wonderful feeling, to visit a place and be attentive - after all, that is what so much of our work is based on. It is a delightful thing that occured as we stared for an entire afternoon at what are, at the end of the day, inanimate objects - and yet were inspired to think about life: its inherent dynamism and unpredictability, transient quality, and challenging nature. Last year, Heist lead design researcher Naima won a scholarship to do her Masters at the EIT Digital Academy in Finland. Immersing herself in the culture, Naima has written to tell us of her life in Finland, from education to depressing winters. We’ll be sharing her experiences over the next few weeks. Here is Part II of Postcards from Finland. To read Part I, please click here. The Finnish Library - a mirror of society? In 2017, Finland celebrated its 100th birthday by gifting a new state-of-the-art library called Oodi to its citizens. At Oodi, and at other Finnish Libraries, citizens have free access to more than books; they have sewing machines, 3D printers, audio-visual recording studios, and even a karaoke bar. They can even rent items and gadgets of occasional use such as sports equipment and power tools. These offerings reflect the sharing economy and openness to second-hand purchases, something I have repeatedly observed in Finland. As a public building, Oodi is also designed as a platform for visitors to interact not just with each other but also the space, so they can express themselves. Service design and co-creation was used to involve the citizens, discuss the solutions for each floor and design the furniture and signs. This appreciation of active citizenship is reflected by a co-creation space inside the library where visitors are invited to note down their observations, ideas, and opinions. Everyone is welcome at the library and this reflects the keys to Finland's success: equality - learning and education for everyone - and democracy. When standing on the new library’s balcony, people can take a look straight into the building next door which is located at the same level - the Finnish parliament. Finland does quite well when it comes to gender equality. By this, I mean that the notion of having one girl sitting alone in the Mechanical Engineering class is a thing of the past. But even if there is only one girl, the girl would not be addressed in a different way. A student is a student. Of course, equality is still not perfect when it comes to top management positions, but Finland can lead by example. Perhaps gender equality here is somehow correlated to the fact that the Finnish language knows only gender-neutral pronouns? Although my mother was never a hoarder, she did collect items that had sentimental value. Growing up, the cabinets in my house were peppered with old sport trophies and handmade mother’s day gifts. Unique amongst the antique trinkets and memorabilia of her youth, was her collection of old matchboxes. These originated from the height of the disco craze in the ‘80s and early 90s, when matchboxes were not only useful to keep around, but also served as miniature advertisements for the clubs. For my mother, these became keepsakes and a capsule of memories to remember. Every time she went to a new disco club, she would make it a point to collect their matchboxes. While spring-cleaning late last year, we stumbled upon her matchbox collection, slightly discoloured and dusty. In an effort to find out more about life in Singapore during her youth, I convinced my mother against throwing them out, and encouraged her to share the stories behind these tiny boxes. With them came a glimpse into Singapore’s past, and a snapshot of memories that seemed almost a lifetime ago. Although this is just a small fraction of my mom’s collection, I would like to share 3 of the most interesting matchboxes amongst her treasures. Zouk is definitely a familiar name for many Singaporeans but I’m sure many of us are not aware that it opened in 1991 and is Singapore’s oldest club. My mom speaks fondly of their ‘Thank God it’s Wed” event that has since evolved into the popular Mambo Jambo. According to my mom, Fire used to be the hottest and biggest disco in Singapore in the early 90s. It would be tough to find a 90s party goer that did not recognise the name of this three-floor disco burning in the heart of Orchard Plaza. An underwater-themed disco off Grange Road, Atlantis was one of Singapore’s first themed disco. It’s elaborate interior was the brainchild of a Disneyland designer that helped materialise the vision of the club’s owner. However, despite its extraordinary interior, the club was forced to close its doors when the recession of 1985 rolled around. Have you been to any of these clubs? There are several meanings of the word move. It doesn’t necessarily have a good or bad connotation, it very much just is. However, as a verb, one of the meanings of move is to make progress; develop in a particular manner or direction. Over the new year, Heist moved. We moved into the new year, and we moved out of The Working Capitol into our very own studio. Moving can be an exciting or harrowing experience. It often is both, even for someone who has experience. Moving is inevitable. Everyone would have moved at some point in their life, whether it’s your home, country, office, school or job. Because moving is inescapable, we thought we’d share five things we learned from our recent move. No matter how much planning you do, something will go awry. Setting up the internet for our new office is the perfect example of this law of the universe. We’d gotten in touch with two internet service providers, but due to the festive period, only one was prompt in getting back to us. Naturally we went for the service provider who replied to us and they estimated that the service would be set up by end January. But that didn’t happen. We are now in February, and actually, it still hasn’t happened. After a site inspection, we were told that a new cable had to be laid from outside the building - which of course, is a heritage building protected by multiple layers of permissions and rules…. And this would mean a three to six month wait for the system to be set up. We simply couldn’t wait and had to end our agreement with service provider A. We’ve since been working with service provider B and hope to have everything sorted soon, so prayers are welcome! Those are the two words that open The Hitchhiker’s Guide to the Galaxy, and the two words I tried to live by throughout the entire process because, see point #1. I learnt that it’s best not to be afraid to make decisions with imperfect information - because the truth is by the time you get all the information you want to make the decision, it is often too late. From choosing tables to ordering the right style of couch, I often had to make decisions on my own and hope it all worked out! Everything is urgent, but not everything is important. Prioritising is key if you want to remain sane, not just with moving but in everyday life. Take into account both the long-term and short-term goals and milestones in order to know what should come first, and how much time should be dedicated to each task. This helps you track and build your task list, and you’ll feel accomplished as you progress and check each task off! This was a trip of many firsts for me – it was my first time in Vietnam, first time on a GoViet bike, first time in field with the Heist team and first time wearing the design researcher lens as we immersed ourselves in the culture of Vietnam. Compared to my previous travels, this was an extremely different and eye opening experience, one I would have never had as a regular tourist. Ho Chi Minh City is a hive of activity. If I had been visiting for fun, I’d be focused on conquering all the places recommended by Lonely Planet. But as a design researcher, I started picking up on the cultural nuances, taking time to notice how people used rubber bands as their makeshift wallet, or how they were able to create space from their small bikes to stack and transport goods. I was blown away by the sights and sounds of the streets. The bike riders were like swarms of bees, zipping through the lanes like an army. Street vendors sold an assortment of things from fresh produce and local delights, to shampoo sachets and cleaning sponges. The crowd swelled after working hours as the riders rode through the market and did their grocery shopping, all while staying on their motorbikes. Learning about vibrant Saigon at different times of the day while remaining observant (keeping the lens on!) was exhausting yet electrifying – and I loved every second of it. We spoke to people on the streets and were invited into some of their homes to gain a deeper understanding of Vietnamese traditions and values. We mingled with locals after work and joined a rooftop BBQ party for students who were learning English. Not once did we feel foreign here - rather, it felt as though the city embraced our curiosity and gave us so much to learn in return. Street food is often a highlight across Asia, and while I had my fair share of pho, nothing quite beats enjoying a Banh Mi breakfast with the team along the Saigon river bank. Soaking in the juxtaposition of sounds – the serene and calm waves lapping the shore in stark contrast to the loud and ceaseless honks on the road behind us – was fascinating. The fact that this moment came to us after an extremely hectic week probably added to the blissful feeling of a momentary pause. My first immersive field experience has been exhilarating and I feel truly privileged to gain a new perspective on this special country. Here are some of my favourite moments captured by the team and I – enjoy! 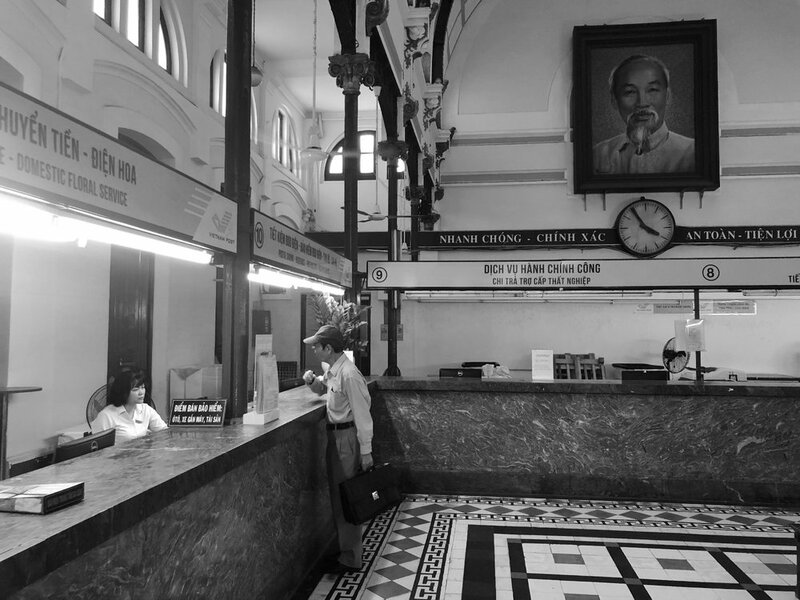 Characterized by French architectural elements, downtown Saigon’s post office opened its doors in 1981. Fast forward to 2019: team Heist pays the historical building a visit, Kodak disposable cameras in hand. Entering the post office was a multi -sensorial experience: voices and footsteps echoed around the space, flooded with light - it was like entering a movie set. We were greeted by two maps, one showing the city’s surroundings and the other illustrating the telegraphic lines of Vietnam and Cambodia. Framed by a linear series of iron arches, a portrait of Mr. Ho Chi Minh stands front and center - unmissable. We observe from a distance; people are scribbling on their postcards to send to loved ones, just like countless others did decades ago. Legend tells me there is one man — Mr. Duong Van Ngo — who serves as a public writer and has been stationed in the post office for close to 30 years. Mr. Duong translates and scribes for anyone who sits down opposite him, articulating their thoughts in either English or French. Although I wasn’t fortunate enough to catch a glance of him this time around, I can only imagine how fascinating a conversation with him would have been. We would get some gold-nugget insights on the stories he’s heard, delivered in gibberish or poetry, which he had to convey on paper. Alone, lodged in a space of transient passerbys, transcribing their burning hopes and darkest fears. What anecdotes would he have to share? What love stories, family feuds, wonderful adventures or tragic sorrows? I jot down a couple of lines to send to my family back home, signed from Vietnam with love. Four stamps later, my post card was on it’s way to Casablanca, Morocco.